Archaeologists that participate in the Pyramid of the Sun Project, conducted by the National Institute of Anthropology and History (INAH Conaculta), discovered a series of deposits at the interior of the Prehispanic construction; one of them may be the offering placed during the first 50 years of our era, to consecrate the beginning of the construction of the greatest monument of Teotihuacan. The team of researchers integrated by archaeologists Alejandro Sarabia, Saburo Sugiyama, Enrique Perez Cortes and Nawa Sugiyama, announced this finding registered during explorations conducted in the 65-meters high pyramidal structure from 2008 to 2011. Using the 116-meters long tunnel excavated in the 1930’s decade by archaeologist Eduardo Noguera, the Pyramid of the Sun Project, directed by Alejandro Sarabia, excavated 59 stratigraphic wells and 3 short tunnels, in order to reach the mother-rock level and verify the presence of burials and offerings. “We knew that if Teotihuacan people would have placed something inside the monument it would have been done at the tepetate level, so we made a probing well at the end of the tunnel and a short conduct to reach the center of the pyramid, since Noguera tunnel was carved approximately 6 meters to the west of the center of the monument”, commented Perez Cortes. Over the course of the exploration were discovered –at different distances from the entrance of the tunnel- 3 architectural structures constructed before the Pyramid of the Sun, as well as 7 human burials, some of them corresponding to infants, that were buried before the construction of the building, as well as 2 offerings, one of them of great richness. The sumptuous offering was discovered at the meter 85 of the tunnel, inside the constructive filling, “so we know it was deposited as part of a consecration ceremony of the structure, probably at the beginning of its construction more than 1900 years ago” mentioned Perez Cortes, researcher at Zacatecas INAH Center. The rich deposit, where a greenstone mask outstands, was integrated by several levels of objects; since the area of archaeological material extended to the south of the limits of the probing well, they decided to expand the exploration. Objects that integrate the offering “were elaborated with different materials and techniques; a considerable amount of obsidian pieces outstand, such as projectile heads, small knives, an anthropomorphic eccentric artifact and 3 anthropomorphic figures adorned with shell and pyrite eyes, also accompanied by projectile heads”. 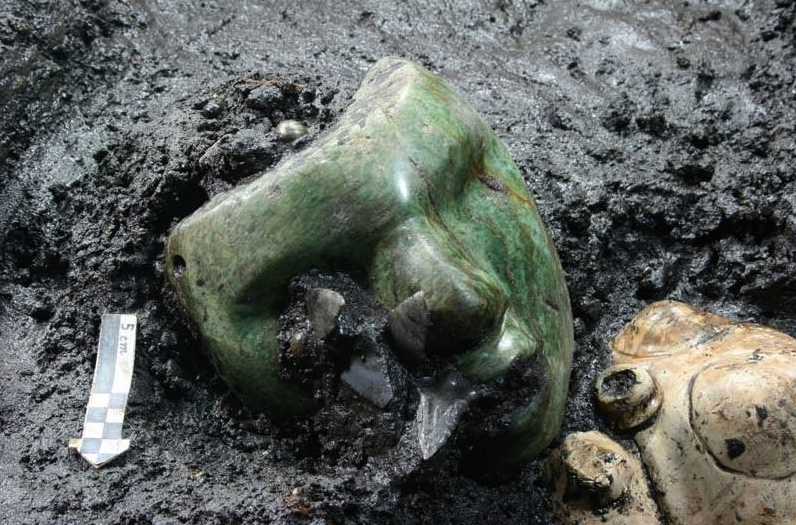 Among the 3 greenstone sculptures found, outstands an extraordinary anthropomorphic mask carved out in one piece, with eyes inlayed in pyrite and shell, declared Perez Cortes; the serpentine mask, according to studies conducted by Dr. Jose Luis Ruvalcaba, from the National University Physics Institute (IF UNAM), is the only greenstone mask discovered until now in the ritual context of Teotihuacan. The 11 centimeters high, 11.5 wide and 7.8 cm deep mask is different to other Teotihuacan masks because it presents smaller dimensions and has volume; it is possible that it was a portrait. A seashell was found next to the sculpture. The offering also contained 11 Tlaloc vessels, most of them fragmented, placed in the center of it. Other objects deposited include 3 pyrite discs, being the one with 45 centimeters diameter mounted on a slate slab the greatest recovered until now in Teotihuacan. An important amount of animal skeletons was found. The skull of a feline was placed to the northeast; a canine to the south, and an eagle covered with volcanic rock, to the southeast. The bird was fed before the sacrifice with 2 rabbits, as analyses reveal. This kind of fauna is similar to the one found at offerings of the Pyramid of Moon. Researchers from the Pyramid of Sun Project at Teotihuacan Archaeological Zone (ZAT) remarked that the offering remained underwater, since humidity of the monumental structure concentrates on the base and central area. Dr. Saburo Sugiyama, professor at Aichi University, Japan, and Alejandro Sarabia, director of the archaeological zone located in Estado de Mexico, indicated that for a long time before the discovery, the function of the pyramid was linked to the underworld because of the tunnel excavated by Teotihuacan people. “Nevertheless, objects found would be indicating that the Pyramid of the Sun –which covers an approximate area of 5.6 hectares- was possibly offered to a rain deity, an early version of Tlaloc, during the first 50 years of the Common Era”. “Until now, we can only offer a general interpretation of the findings, although it is evident that some of them present the same distribution pattern already observed at the Pyramid of the Moon burials”, concluded the specialists. The name Pyramid of the Sun comes from the Aztecs, who visited the city of Teotihuacán centuries after it was abandoned; the name given to the pyramid by the Teotihuacanos is unknown. It was constructed in two phases. The first construction stage, around 100 A.D., brought the pyramid to nearly the size it is today. The second round of construction resulted in its completed size of 738 feet (225 meters) across and 246 feet (75 meters) high, making it the third largest pyramid in the world, but being much shorter than the Great Pyramid of Giza (146 meters). The second phase also saw the construction of an altar atop of the pyramid, which has not survived into modern times. 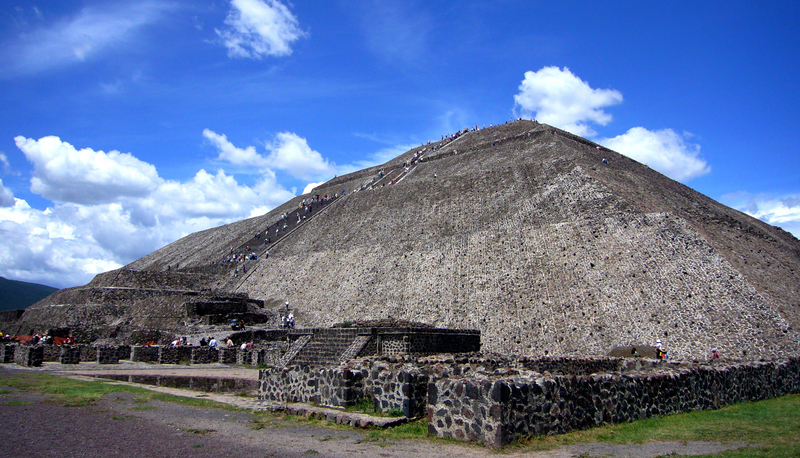 The Adosada platform was added to the pyramid in the early third century, at around the same time that the Ciudadela and Temple of the Feathered Serpent, Teotihuacan Pyramid of the Feathered Serpent were constructed. Over the structure the ancient Teotihuacanos finished their pyramid with lime plaster imported from surrounding areas, on which they painted brilliantly colored murals. While the pyramid has endured for centuries, the paint and plaster have not and are no longer visible. Few images are thought to have been included in the mural decorations on the sides of the pyramid. Jaguar heads and paws, stars, and snake rattles are among the few images associated with the pyramids. It is thought that the pyramid venerated a deity within Teotihuacan society but the destruction of the temple on top of the pyramid, by both deliberate and natural forces prior to the archaeological study of the site, has so far prevented identification of the pyramid with any particular deity. However, little evidence exists to support this theory.